The Journal of Slavic Linguistics (JSL) is a peer-reviewed academic journal. It publishes research articles and book reviews that address the description and analysis of Slavic languages and are of general interest to linguists. Published papers deal with any aspect of synchronic or diachronic Slavic linguistics – phonetics, phonology, morphology, syntax, semantics, or pragmatics – which raises substantive problems of broad theoretical concern or proposes significant descriptive generalizations. Comparative studies and formal analyses are also published. Different theoretical orientations are represented in the journal. JSL has been published by Slavica Publishers since 1993. It was adopted as the official journal of the Slavic Linguistics Society in 2006. SLS members receive a subscription to the journal as one of the benefits of membership. JSL is usually published in two issues per year. The current Editors-in-Chief are Franc Marušič and Rok Žaucer (University of Nova Gorica). 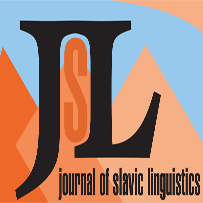 For more information about the Journal of Slavic Linguistics, go to the journal’s website. If you are experiencing problems accessing the journal’s website, please let us know at journalofslaviclinguistics [at] gmail [dot] com.